In 2015, euthanasia accounted for 4.5% of deaths in the Netherlands, of which 93% were performed by a GP. 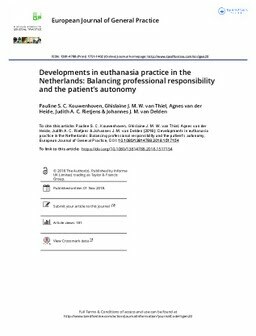 Historically, a conflict of physician’s duties—to alleviate unbearable suffering and at the same time preserve the patient’s life—is central to the justification of euthanasia practice in the Netherlands. However, there seems to be a shift towards a greater emphasis on the patient’s autonomous wish as the primary basis for euthanasia. This shift has consequences for the role and interpretation of the physician’s duties in end-of-life care. This paper aims to describe these developments in euthanasia practice and end-of-life decision-making. We describe important relevant developments and look into the role and the meaning of two dimensions of the concept of ‘patient autonomy’ regarding end-of-life decisions, in particular, the euthanasia request. We claim that the concept of autonomy ‘as a right,’ which can be distinguished from autonomy ‘as an ideal,’ narrows the physician’s window of opportunity to offer end-of-life care other than euthanasia.